We recently had visitors who were on a whirlwind tiny house tour, and it was super-fun to be included on their tour. One thing they noticed about our house was that we had more stuff than most tiny house folks. I guess we aren’t totally minimalistic, or kids mean more stuff. I don’t know. But I do know that managing stuff is a constant job in our home. Yesterday I finished pulling out my spring wardrobe, then I carried all the storage bins of winter clothes to the shed. I often walk up and down the hill carrying stuff–loads of laundry from the washer to the clothesline, bins of clothes, empty mason jars, full mason jars, canning supplies, food, garden tools, etc. The sheds are an important part of our daily lives, making our tiny home function and giving us a place to keep stuff we still use but don’t need in the house. Pictured below are the sheds that support our tiny house. The second photo is a collage I made over a year ago, but the sheds are the same. 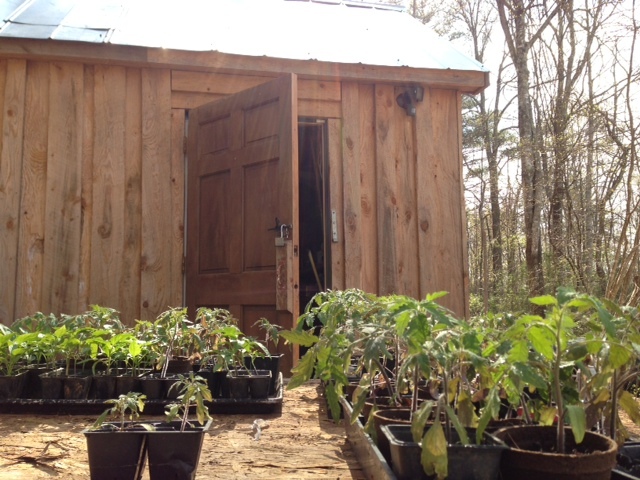 The shed up the hill is sided with local hemlock and is 10’x 10′. 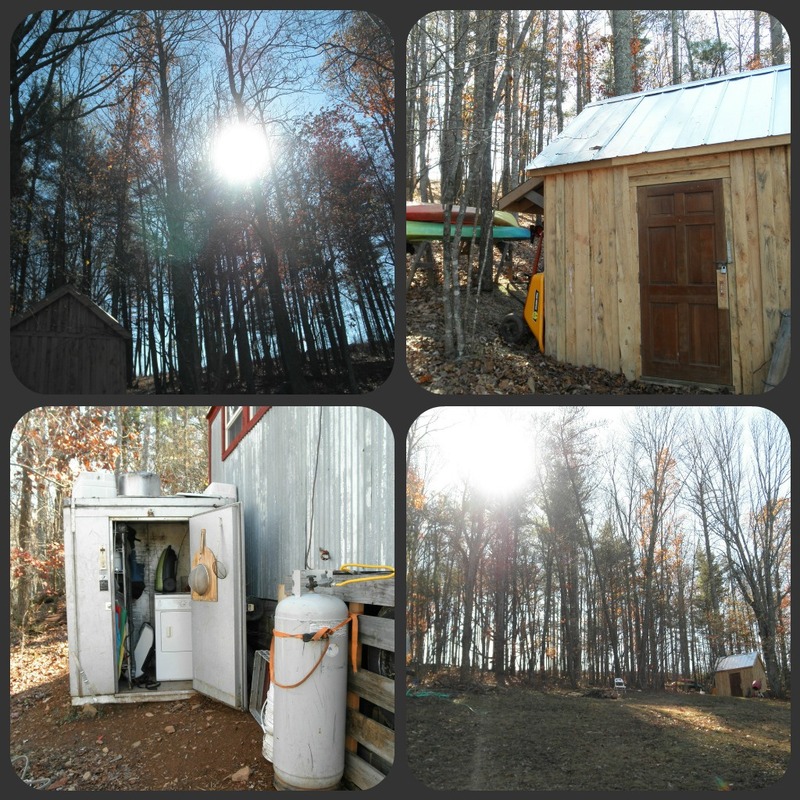 It houses our washing machine and pressure tank for the well as well as camping gear, tools, canned goods, canning tools, potatoes, chicken feed, and Christmas decorations. It even housed our chicks, ducklings and seedlings this winter. The shed behind the house is a salvaged walk-in cooler. It houses the dryer (which we use in winter) as well as baking pans, large pots, a vacuum cleaner, and arts and craft supplies. You will notice that the big house is missing from the image on the bottom right. Amazing changes have happened on our property in a year and a half! This article was so enlightening for me. We are a family of 4, plus one on the way. Its never occured to me to think about sheds as I was stuck about thinking about tiny houses and that is all. Big deep breath…there’s another way, sigh of relief! I think this is wonderful! What a great idea. I am not sure why I did not think about this before. We are just now starting the idea to move into a tiny house and I was wondering about the mower, grass cutting supplies etc, so this would work for all those extra’s you just don’t want to part with that you use once a year (Christmas stuff). Thanks for all the tips and advice.